Hotels were very good! Stephen, our daily guide, was Excellent! Organization of whole trip was very good! Our bus driver was Excellent! Food was very good! Extra excursion, Gondola ride, was very SHORT! Barely 20 minutes! Our paddler was always shouting at the paddler in front of us and "bumping" into them. Not worth the total fee charged. The office in Milan's airport on trip back home was closed (too early) so I couldn't redeem my sales slips (about $1,000) to collect the tax refund do back to me. Plus, the connecting flight in Belgium didn't allow enough time to track down the office and collect the taxes on our items spent. NOT GOOD! Still haven't collected! Fr. David Harvey is a "great host!" The Italian Trip was overall Excellent outside of a few gliches! The trip was welled planned. The hotels were top notch. Our guide, Sergio was the best! Great hotels, well planned excursions and the tour guide, Sergio was the best ever!!! Our tour guide Evan and our bus driver Raffaele were beyond expectional! The locations visited were amazing and the hotels were were wonderful. Tour Manager & Bus Driver! Collette did a top-notch job, from preparation before the trip to the end, Christina was an amazing Tour Manager,her knowledge is incredible. Our tour was so interesting and we learned so much about all the areas of Italy that we visited. The local guides were also very good and made the tours very informative. This was my first guided tour and I have recommended Collette to several people already. The trip was worth every penny. We visited many historical places that I never dreamed I would actually get to see. The Colisseum in Rome, Vatican City, Capri, Pompeii, Venice, Florence, and so much more. I would do another trip with Collette any time. I would recomend them. we had a very good tour guide. our driver for the bus was also very good. I liked the idea of the tour bus. Don’t include Capri..way too commercial and a wasted day ! Well organized.Tour guides were knowledgeable and considerate of the tour group.Destinations were excellent saving the Isle of Capri. Capri wasted a whole day most of which was spent riding a ferry.on a return to Italy my group of 16 people agreed to ont go to Capri. More time would have been spent in Sorrento. Leaving Capri! Straza Rome,Venice,and Verona were great. Would have switched Capri for extended stay in Sorrento. The trip of 40+ people was well organized and orchestrated by the tour guide. I was very pleased with everything that I saw and with the whole experience. I loved Rome as a whole...all the history was memorable. Our tour was well-planned and conducted. The guide and driver were very accommodating. The whole tour went off without a hitch. I loved all of the sites, but the Isle of Capri and Stresa were exceptional. Would book again with Collette. Would recommend Collette for anyone that wants to take a worry free trip and see a good snapshot of a country. We have been on 3 Collette trips and have enjoyed them all and look forward to booking more. With them. Collette does it all for you. As usual the tour was very well organised and gave the snapshot of Italy we wanted. With the large number on the trip and a large number of included meals these became a bit similar and therefore monotonous and naturally the service was, at the best, slow. We will in future look for trips with smaller numbers, twenty or less. Costs have risen significantly over the last three or four years. Perhaps reducing the number of included meals or meals which form part of an optional trip would help. an amazing way to see Italy !!!!!! Experienced tour director made the difference! Well designed tour for us. Excellent choice of hotels. Tour director made the difference imparting culture history general knowledge and likable personality keeping all 46 of us happy. Couldn't get to Switz because of highway construction. After asking for OUR permission, she arranged a spur of the moment tour to Oira where they make cheese and wine - beautiful town of 250 people, NONE in our group were disappointed that we didn't see Switzerland! You can't top that kind of experience! It was a great tour with lots of activities. Our guide and driver were top notch. All included tours very good. We only did 1 of the optional tours because found them a bit overpriced. 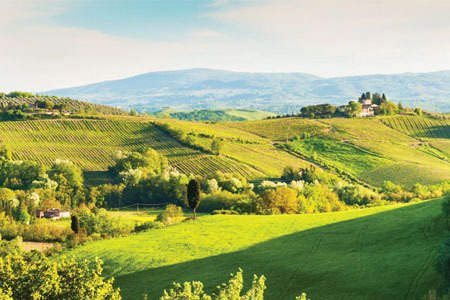 One of my favorite parts was the wine tour and lunch in Tuscany. Also loved our time in Florence. Everything on the tour was perfect. From the time we were picked up at home to be taken to the airport to being greeted at our destinations to a great tour director we could not have asked for more. We will always try to use Collette in the future. Perfect weather, tour guide, bus driver and fellow people on the tour. Well planned itinerary. Your Collette staff was wonderful. Caring, hard working and knowledgeable. My only gripe would be your choice of a connecting flight and not flying direct. My Boston to NY flight was cancelled and we arrived late. Otherwise, I had the time of my life. I am a repeat Collette's traveler and I look forward to our next journey. Non stop adventure. I can't believe we did and saw so much of Italy in just two weeks. We shared it with wonderful people; the Collette staff and our fellow travelers. Venice was stunning! Great value for price. However, it would be nice if Collette would do direct flights. For our 20th anniversary, we did it right! Top notch service. Everything was taken care of. Tour manager Christina was awesome! Coach driver Titsiano was very professional and friendly. My expectations were exceeded. Already planning the next experience. My experience was something I will never forget. I’m so happy we chose Collette. A perfect holiday. Couldn't ask for any better. Every detail was attended to by our tour guide. He took all of the usual travel stress away. We could not have had a better experience. This tour was so professional in every way. I travel a lot and this was by far the most organized trip that I have taken. Our tour guide was exceptional, as was our driver. Every aspect of the trip was wonderful. We will definitely buy from Collette again. The entire trip flowed very smoothly. All the accommodations were extremely comfortable and usually within walking distrance of town. Our tour manager Ben was always very pleasant and made sure we all were enjoying the trip. Venice was my favorite city in Italy. Just walking over the bridges and along the canals were so quaint. St Mark's square was just beautiful. We stopped at one of the outdoor cafes and had lunch, watched people and the beautiful buildings was just inspiring. The tour was wonderful - everything was handled very well. Answered our questions right on the spot. Asked if they could do more. Found ways we could save money. John Carlos is a GREAT driver Denise could not have been any better. - always was available - some had walking problems and she ran the tours so everyone had a great time. 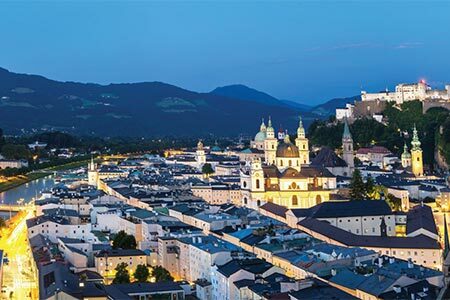 - She professionally reminded some on the tour that Italy and some of the hotels (which were GREAT) were not Americanized, and to enjoy these new experiences. - Mary and I would have no problems taking another tour with Denise or any of the other tour directors we have been with. Very wonderful and knowledgeable tour guide, Denise Emens, timing was perfect on everything. Recommendations for meals from our tour guide was great. Denise Emens was excellent as our tour manager. She led us through Italian Vistas thoroughly and entertainingly. See earlier description on this survey. Thank you for traveling with Collette to Italy. A member of the Guest Relations Team will be reaching out to discuss your feedback. I enjoyed the expected highlights but loved the unexpected ones. The day trip to Capri was like a present that kept opening to another surprise. The farewell dinner on the isle in Lake Maggiore was the best way to spend our last night with the group. Awesome trip---even exceeded our expectations! Sergio our guide was beyond excellent----always helpful,cheerful and extremely knowledgeable. He should get a raise! All cities and sites visited were wonderful. The Sistine Chapel is a "Must see"
Awesome trip of a lifetime. Would highly recommend! We had a wonderful trip. It was well planned and organized. Our guide Sergio was outstanding! He was very knowledgeable,helpful and always cheerful. Well organized, top-notch hotels and bus. Wonderful tour all around. Wonderful trip! Tour manager was excellent! Visiting Italy itself was a great experience. I would strongly recommend Collette to any one. The guides were great. Denise, our tour guide was great and our bus driver Antinioj was a very good driver. The entire trip was great with many memorable moments. We would have never seen everything included in the tour on our own. We loved the side trips to the leather store, winery, etc. Our accommodations were the best! How lovely the hotels were! Denise was awesome, I would take any trip she was leading. She was organized, knowledgeable, and had great suggestions. Seeing so much of Italy, I would have to say Venice was my favorite. The hotel in Venice was a great location. Great customer service! The agents are knowledgable and very polite. The customer service agents at Collette were very helpful and they answered all my questions. Our tour guide, Denise Emens, shared her love of Italy with our tour group. She watched out for all of us and made recommendations for restaurants, museums, and great places to shop. This was a well organized tour. Transportation door to door was excellent. Airline arrangements were excellent except for too little time in Paris to make the connection.However, after a call to Collette HQ, the representative made that trouble free. The bad part of the tour was that there was much too much walking from bus drop off points to various tours. Not only was the walks exhausting but the pace was too fast and it was difficult to keep up with the guide. Hotels were good but they were not centrally located. The meals that Collette provided were not that good although acceptable. Despite all of this the tour was very comprehensive and I recommend it to anyone who is traveling for the first time to Italy. A good comprehensive tour of Italy, except for a large amount of fast paced walking. Meals provided were not the best food I ate during the tour. Would go with Collette again and highly recommend them to friends! Wonderful trip. This was our first group guided tour. Don't know how it could have been any better. Really exceeded our expectations. From the tour manager, coach driver, local guides everyone was excellent. Hotels and food were great. You certainly stay on the go but that is what we wanted. If you go that far you want to see all you can. To sum it up, everything was first class. Would highly recommend Collette and look forward to going we them again! Saw everything we wanted to and more! Tour guide was excellent. Passport was stolen out of luggage in hotel room. I was not happy with the people who made the flight arrangements. If I had it to do over again, I probably would make my own flight arrangements. On the flight over, my seat assignment somehow was changed, and the seat I was originally assigned was empty. I would up all n the very back of the plane with a noisy group of tenagers. The first time I inquired about upgrading I was told to wait. Then when I later inquired, I would have to pay $300 more because I was changing my ticket. Not impressed. Hotel room in Florence was extremely SMALL. All others good especially the last one. Rome was the most historical but all excursions extremely crowded. Thank you for traveling with Collette to Italy. A member of the Guest Relations Team will reach out to discuss your feedback. Traveling with Collette in Italy was the memory of a lifetime! First time vacationing in Europe, and first time with Collettte. Incredible experience and worthwhile investment! Great value. Avoided long tourist lines, and got to see more points of interest than if I were on my own. Hotels were tremendous, the motor coach was quite comfortable, and all the food and wine was superb. Our tour manager, Sergio Solazzo, made a huge difference. He really took care of us. Two thumbs up for Sergio!! Saw more sights and learned more history than I thought possible. Rome, Anacapri, and Florence were highlights. There was considerable walking and standing involved, but the tour manager maintained a reasonable pace, and I could keep up as a 73-year-old. Couldn't have seen and did as much at a slower pace. On our 25th Anniversary we went on a Gondola ride in Venice with Music. It was unbelievable. Thank you for your message. A member of the Guest Relations Team will be reaching out to discuss your feedback. Everything went well and we are sure to use them again. Excellent Italy tour. Bus ride was too long w/ frequent bus stops. Marta was an excellent Tour Manager exhibiting GREAT patient, very knowledgeable and informative. She explained the history of Italy thoroughly and was able to answer all our questions. When she wasn't able to, she would asked the local guides and follow up with us immediately. She was extremely personable and energetic. Hotels location were walking distance to the plazas, and Marta gave us directions on how to return to hotel via water taxi, etc. Bus Driver was professional, assisting passengers on and off the bus. He exhibited an excellent attitude and friendly, trying to always go beyond the call of duty. The hotels were outstanding. The tour guide was incredible. I would, and have recommended Collette to many people. So much was included. The hotels were so well positioned and very high quality. The best of Italy in 2 weeks! Italian Vistas was a wonderful way to see a lot of Italy in a short time. 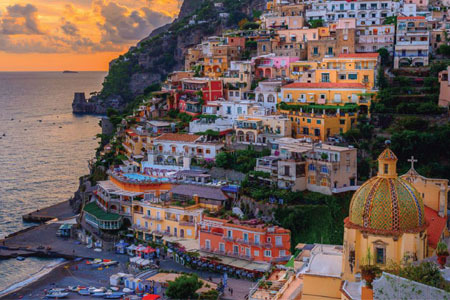 We saw just about everything you can think of when you think of Italy. Our tour manager, ****** was great. She is very knowledgeable and helpful. She arranged for a cooking class in Rome that was lots of fun. Make sure you are in pretty good shape and have comfortable walking shoes, you will need them! It is a great tour. Sunrise over the Duomo viewed from our breakfast room in Florence! The city tour and museums in Florence. The Autogrill was an unexpected surprise. Be sure and get the hot chocolate. All the meals were fantastic with all you can drink vino rosso. I know why people go back to Italy over and over. Tour guide Denise Emens was fantastic. Didn’t have to worry about anything with collette. Just get on the bus and go. 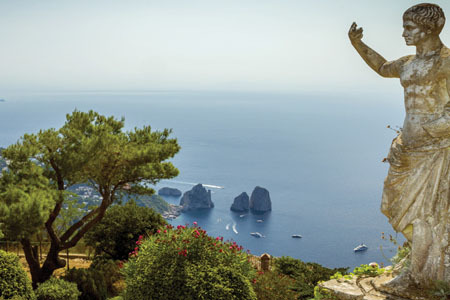 Tour of the island of Capri and Pompei. Better communication on their extended tour. Tour over all was an average tour. Better communication on their extended tours. Rome was a good stop. Liked Venice. The Italian Vistas tour was great. Our guide, Luigi, was fantastic. We loved each of the places we visited on the tour and are already looking forward to visiting Italy again! It was wonderful. Our guide Luigi was fantastic. We loved each of the places we visited on the tour. Our favorites were Sorrento, Venice, Rome, Milan, Pompei & Florence. Collete Italy trip maximizes time, minimizes hassle! Two suggestions: the brochure says the limo TO the airport is tipped, but no mention of a tip in limo FROM the airport. Seems both should be treated the same, and I'd like Collette to take care of the tip on both and say so in the brochure; secondly, it would be good to provide travelers an option of ordering some euros ahead of time so we aren't scrambling for local currency in the right denominations at the start of the trip. Great hotels in great locations. Great tour guide. Great or very good local tour guides. Restaurants were good to very good. Some locations (e.g. Capri) were too shopping-oriented with not much else to do. Vatican trip was my favorite, and skipping lines with our group-entry format was really nice! Most enjoyable tour at an appropriate price. Well worth the money. Will use them again! Tour manager was really top notch. Had a great group of fellow travelers who made the trip so enjoyable too. Trip was well paced. Hotels were in excellent locations. Rooms were very small but this is typical for European travel. Some the sponsored demonstrations and visit were too long.but all were enjoyable. Comfort and safety were certainly a priority for us. Would like to have had free water in the coach as other tour companies have had when we travel. The tour included everything I had wanted to see in Italy. The hotels were all lovely and located perfectly for our touring. The guides were very knowledgeable and interesting. It was very well-organized to maximize our experience. Perfectly planned to include everything I had wanted to see and do in Italy My three sisters and I had a memorable, once-in-a-lifetime experience! I was fascinated by the Colessium and Pompeii--the condition of the centuries old buildings. The customer service representatives were very helpful when I lost my passport upon arrival at Heathrow. When I had to get a different flight onto Rome, I still had someone at the airport to take me to the hotel. I had been to Italy one time previously on a self planned tour with my daughter. I learned so much more at the locations we visited this time. Our tour manager, Gary, was so informative about every place we visited. The local tour guides provided detailed, humorous information at each stop. Very well planned itinerary. Our tour guide had much knowledge of all of Italy. We were well feed and very well entertained. All tours and excursions were very easy to manage time wise, but of course there is never enough time to see it all. Since I like any kind of history, The Rome ruins and Pompeii itself peeked my interest. but even as young man I was a Michel Angelo fan and seeing the Pieta with my own eyes chocked me up. Our trip of a lifetime and above and beyond our expectations! A wonderful experience. We saw all the highlights of Italy, and had time to enjoy every minute of it. Our tour director was outstanding, well prepared, and went well above and beyond our expectations making the trip enjoyable for everyone on the tour. The local guides could not have been better as well. 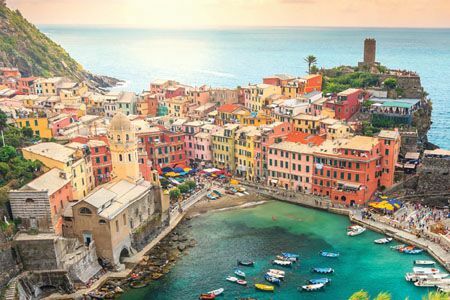 The highlights of Italy you have always heard of: Rome, the Vatican, Sorrento, Isle of Capri, Pompeii, Florence, the Leaning Tower, and Venice plus many, many extras! Excellent tour manager and local tour guides. Incredibly skilled bus driver for winding, narrow roads to crowded city streets. Only letdown was pickup driver from airport in Rome was hard to find and then he wanted to wait for others who had not arrived. We finally got to the hotel (without them), late for introductions. There needed to be another driver for the next arrivals. Stresa was a wonderful place to relax after the busy schedule of sights and cities. Pompeii was unexpectedly impressive. The Vatican and St. Peter's Basilica were awesome. Sure would like to see all that art without 1000's of people around. It'd be even more inspirational! Hello, thank you for bringing this to our attention. We appreciate your feedback as it helps us to improve the tour for future guests. We look forward to traveling with you again soon! Tour guide *Personal Details removed by Feefo* was wonderful as was bus driver*Personal details removed by Feefo* Vert informative and friendly. No waiting in lines and if we needed any help, we felt she was there for us. A wonderful experience! Everyone was wonderful. Italy was my favorite trio made special by Collette. Collette and a great tour of Italy. This is the 4th trip I have taken, with Collette. I loved the tour of Italy. We had many extra options to choose from. The food was delicious. *Personal Details removed by Feefo* our tour guide was great, as was *Personal Details removed by Feefo* our bus driver. I loved Venice and Stresa, and was glad to be escorted in Rome, Florence and the Naples area. Your tour, is the only way, to go. I would recommend it to anyone. I loved the tour of Italy. We saw everything we wanted to see. It was great to get into the venues, with the tickets that had been purchased for us. The local tour guides were all good. The food was delicious. The hotels were all fabulous. *Personal Details removed by Feefo*, our tour guide was really great. *Personal Details removed by Feefo*our bus driver, could go anywhere. I couldn't have asked for anything more. Our Tour Manager, *Personal Details removed by Feefo* was awesome! The trip was fast paced but we saw things that ours wouldn't see. She had such a love of Italy and the local guides were great too! The passion they shared about the places we saw was contagious. You had to enjoy every place and every story. The tour was well rounded with places to see, to eat and allowed us to get to know many new friends! In Rome, the Coliseum and the Vatican were my favorites due to their history and beauty. But when we saw the Duomo in Milan, it took my breath away! The overall history of the places we saw was overwhelming. You don't see this in the States unfortunately. All aspects of the trip were great especially our tour manager. Even though it rained Florence was fantastic. Tour was OK. It was a lot to see in a small amount of time. I wish we could have been in one place long enough to buy timed tickets so we could go inside some of the places. Chosen restaurants were really bad. They were what Italians think Americans want to eat. My family is from Italy and this didn't represent real Italian food. The kind you would get in a non-tourist area. Lots to see but we were only there long enough to see the outside. Couldn't get timed tickets to go inside. Everything went smoothly from home pick up, met at the airport, tour guide and bus drivers were excellent! This was my second trip to Italy (first with Collette) so I was more aware of what I wanted to do and to see. There was some overlap with cities I had been too, but also new destinations which were great. Our Tour Manager really made the difference she was excellent. Thanks *Personal Details removed by Feefo*. The hotels we stayed in were in the best locations, close enough that you could go out and walk to sites you wanted to see in your free time. Loved the sites we visited. Stressa was beautiful, when were arrived in the evening it was raining and the clouds were covering the lake so we could not see much. But when we woke up in the morning the rain had pasted through, sky was blue, there was snow on the Swiss Alps foothills and clear view of lake, island and the Alps. We had great luck with the Weather! Collette had a very comprehensive tour and excellent tour manager on our tour! Every day had its own great set of memories! This is the 2nd time I have taken a Collette Tour. For the most part, the tour was what I expected from Collette, however, some of the hotels were not up to par. Stresa was a highlight. What a beautiful place to visit. Thanks for reaching out and letting us know about your experience with the hotels. We will pass your feedback along to members of our product team to review. We had a wonderful with our Collette tour of Italy. I would recommend to my friends. Our tour guide , ******* was exceptional! Highly recommend ! Shopping in Florence! Sight seeieinf, Venezia gondola ride, and more! As I said in my evaluation, I liked the interesting and varied itinerary and I thought Maryse was an excellent Tour Manager. We loved the Italian Vistas tour! All of our tours, tour guides, hotels and optional excursions were top notch. 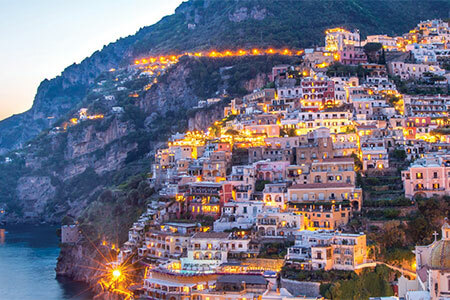 For our first trip to Italy, it gave us a great sampling of where to go and what to see. The food! Well, I could write a book on the food and wine alone!! I would love to return and concentrate on the smaller towns. Our tour guide and driver were magnificent! If you are considering this tour, don't hesitate! I think the late October/early November was a great time to visit. We had 33 in our group and met some amazing people. This was our 4th Collette trip and we keep returning because we have loved every trip with them. Well done!! Would have to say our gondola ride in Venice, but so many memorable moments! Very good service, excellent tour guide, on the most part great hotels (room in Florence with no outside window was a bummer), great included meals. we had a great time. Great tour with excellent Tour Manager. Arrangements were well coordinated and efficient. Documents for travel arrived in a timely manner. The tote bag was colorful and useful. All went well! Loved all the hotels. I felt they were a true Italian experience, not just chains from the US. Guide was spectacular, knowledgeable, and ever gracious. The sites we visited were amazing, especially Pompeii. Service was always prompt and information provided very accurate. My favorite experience was touring Rome and viewing the most impressive works of Michael Angelo inside and outside the Vatican. Capri was also a very enjoyable and happy place, beautiful views. Good hotels. Gary was an excellent guide. I learned much from all the local guides. The service was expected, I can't think of a way of improving. We took the tour to learn as much as we could about Italy and see the most important sites. That the tour did do very well. We also had a much better than expected, terrific meal in Florence. But the time taken with the demonstrations felt like 1 minute and the buying time an hour. Tell people to bring hair conditioner (only one hotel supplied it) and if visiting Venice mosquito repellent. If there was some way to split the tours to faster walkers who want to learn vs slower walkers who want to buy. I do not have a favourite memory as each place we visited had their unique spots. Having free time to discover on our own was really appreciated. I would not go to Sorrento or Isle of Capri again. Chris in Rome really showed his love and his knowledge of his city. There were no problems on the tour, and we had an excellent experience within the scope of what we expected and what we received. Favorite experience was ending the tour in Stresa ... what a beautiful, relaxing and enjoyable place to end a great time! This trip was AMAZING!!! I saw things that I did not see on my first trip to Italy 3 years ago. I loved it! Dinner at Chertosa!! It was fantastic...great food, wonderful music and dancing!!! Our travel manager was excellent (************) and stayed with us until the end. The bus drive (Gean Carlo) was excellent and stayed the whole trip. Would have been nice to stay in Venice 2 whole days and Florence 2 whole days. 1. Not able to book the tour on line. When I filled in my address your system does not recognize Singapore. 2. I have to book through an agent in Vancouver that I used for my Gate 1 tour to Spain in 2015. 3. Your tour information, name tag, luggage tag etc. was delivered to the wrong address according to my agent, Marlin Travel. They didn't receive it until 28th September Wednesday which does not allow Marlin Travel in Vancouver to mail it to me in Singapore on time before my departure on Saturday 1st October. We get the most for our travel expence and experience. When my husband and I plan trips on our own; and we often travel in the U. S. on our own. We are always challenged to find safe, clean hotels close to the sites we wish to visit. I am very concerned about cleanliness! Finding good restaurants can be even more of a challenge. We really like trying new cuisines, a lot. Collette makes it easy to travel abroad. We have been pleased with the hotels they choose. The hotel breakfast have been good, but dinners are not the best. We like that Collette plans the sightsee and buys the tickets before hand. That would be difficult for us on our own. Collette does a excellent job providing a nice bus and excellent drivers for all sightseeing. Your tour guides are excellent. They add so many background facts to the country and sights. The guides add a since of safety, too. We can set back and really enjoy ourselves. We are always sharing our trips with our friends. We tell them all they need to plan their trips with Collette. They will not be disappointed. We really had an over all experience in Italy. The major sights, learned a lot about the history, food and culture from our guides. We loved the food! We plan to return someday. My trip was great. The tour manager was knowledable and very enthusiastic.The accomendations were very nice. We saw a great many special places thruout Italy. The tour bus and driver were first rate. Alexa, our tour guide did an excellent job guiding our tour. She was fun, informative and caring. The sites were well thought out. The food and wine was excellent and the hotels were good. We have been with Collette on six tours now. I think this one was our best yet. Wonderful tour. Florence was my favorite place. I could go back there for several more days. Maybe we will take the Tuscan tour next time. The Vatican was a highlight also. I think it should be included instead of just an option. Over all Collette did a great job. Accomodations, tour guide, tours and food were amazing! Only glutch was the flight out , were scheduled to take. Assigned seats we were given months prior to trip were released by airline. Some where along the line Collette was not informed. When we found out 3 days prior to trip....very stressful times were had. We specifically did early booking to get special seating arranged. All in all I understand they said the airlines were at fault...Collette should have steppes ip and remedies the problem. Hotels in great locations & very nice!! Most of the food included was only fair. I am speaking about the hotel food & the restaurants included, not the lunch at the family owned winery. That was great! Could have done without the woodworking place in Sorrento. Would have preferred to skip Stressa & spent another day in Venice & Florence. Excellent lodging and manager overall managing our group through hordes of tourists. Food good to at times subpar. At times food was subpar. Too weeks in Italy well worth it. Our guide was knowledgable and efficient and the hotels were wonderful. I believe the amount of days that were spent in certain cities should be adjusted- one less day in Rome and another day in Florence would be good. Everything was great! Our guide Maryse was knowledgeable, personable and just fun! She made the trip quite enjoyable. Overall a great time but there were some major disappointments. First, our airline scheduled through Collette allowed us only the legal 45 minutes at JFK between flights. It's a big airport and we would have not made the connection if our flight from Orlando had not arrived early. We literally ran; our luggage did not! Collette personnel blamed the airlines, but it was your personnel who ultimately scheduled it. There were other options, one of which we had agreed to when we first discussed the trip. We could also blame our travel agent, but it is Collette who ultimately booked the two flights. NOT a good start to what was our dream trip. Rome: the tour was excellent and the time to explore on our own let us see what we were interested in. Great Tour Mgr. and Driver. Excellent local guides. Great Tour manager and driver. Excellent local guides. With 3 of us touring, I had a single room which was awful in Florence and Venice. Flight reservations were not well done. Many of the tours were not that good. Everything ran like clockwork! Our guide, Maryese, was wonderful. She was knowledgeable and personable and made the trip so enjoyable. The tours and the knowledgeable information which was provided, was excellent. A guided tour is really the way to go. The tours and transportation were excellent. My first disappointment was at the airport. I couldn't locate the tour group and no one made an attempt to locate me. A bit stressful. Our tour guide was very professional but did not help me with a problem that she had twice promised she would. She was a bit condescending when she spoke to me. That lessened my opinion of her. There were so many beautiful places and fun things, that it's hard to pick one. Venice was wonderful but, so we're Florence, Tuscany, The Sorento Coast, as was Capri and all the places we visited. Evan the tremors from the earthquake were a memorable experience. The service of putting the tour together was very easy and they were very helpful to get it done. There were a few tour options that were extra that should have been included as part of the normal tour. Everything went as planned. There was a lot to cover, almost not enough time to get it all covered without having to hurry. The timeline was packed. We took a morning off to sleep late and rest. We had a good group that was on time and got along with each other. We covered Italy and saw all the things we wanted to visit. Our grand daughter wanted to see Juliets balcony and the Leaning Tower of Pisa. Have not used Collette US yet! This was an amazing trip! Everything was top notched from the Tour Director, Bus Driver, Tour Guides with the historical facts and points of interest! Hotels were very nice (A/C was a problem everywhere) and opportunities to take side trips or shop and relax in beautiful surroundings...all were top notch. Amazing time, wonderful sites and experiences. We certainly plan to travel with Collette again. This was our 4th Collette tour. Like the ones before, our Tour Manager was warm, welcoming, well organized, and extremely knowledgeable. They make you feel like family, and we have made new friends with each tour. It was a busy 2 weeks, which is how we traveled from one end of Italy to the other. They know where and when to visit each site, and have priority entrance to special and popular events. The hotels are top notch, just be prepared for small European size bathrooms. Our last stay was in an amazing converted palace, with views to match! As our adult daughter put it "a trip of a lifetime!" There was so much to see and do, yet you could stay back and relax if you wanted to. I am sure we saw things that the average tourist would miss. Two of our favorite cities were Florence and Stresa. The boat rides and trip to see Murano glass being formed into beautiful pieces was exciting. It is hard to narrow it down to a couple of favorites - it was all so much fun and enjoyable. The tiip of a Lifetime with Collette 2016! Italian Vista Yeah!!!! We had a marvelous time on this tour. The Tour Manager, Gary Bowling was knowledgeable, organized, and fun. The traveling pace of the tour was good and we learned so much. I will definitely recommend Collette to my friends and family. Historic, Breathtaking views and colorful sites. I have been pleased with the tour managers, who have extensive knowledge in the places I have been to. Hotels are anywhere from good to great. Activities are well chosen and there is always enough personal time to do things on ones own. One thing Collette offers that keeps me coming back year after year is that Collette offers transportation to and from the airport if one lives within 50 miles of the airport. I enjoyed all the places that we toured in Italy. My favorite places were the Isle of Capri and Florence. A couple of the local tour guides were not real interesting, hard to understand and could have offered more general interesting information pertaining to the area or eliminated altogether. (Local Guide for Rome and Pompeii were better) The tour of the Monastery/dinner and the Tuscan family owned winery tour/ lunch were great choices. Good selection of extra excursions offered. The only problem that I had was at the airport in Rome. I spent at least 20 minutes trying to find Collette. I found the young lady by accident. She didn't hold up her Collette sign. It was lying at her side. Our tour manager, Gary Bowling was excellent. He was very knowledgeable. The trip itself was amazing. There was so much to see in Rome. I enjoyed the option tour "Rome by Night" "Dine with the Tenors" was very entertaining. Also the Gondola ride in Venice was good. Stresa was beautiful. The hotel "Regina Palace" was fantastic. The spa was to die for! Everything we wanted and expected. Hotel in Florence was very inconvenient.. Very informative, educational and interesting. Overall, the tour was a sound success. The scheduling, the hotels, the visit, the transportation were all in sync. The local guides were knowledgeable of their cities. The physical requirements is on point. One of the hotels was cancelled and was replaced due to other reasons. Other than this cancellation and replacement, it was awesome. We received a Free Dinner in return. This tour includes moderate physical activity. Walking tours, as well as walking slightly longer distances, up stairs or on uneven walking surfaces should be expected. Please note that most shops and businesses in Italy and Switzerland are closed on Sundays and on national/religious holidays. Vatican Museums are not available on Sundays and holidays that fall on Saturdays. Most national museums in Florence, including the Uffizi Gallery and the Academy, are closed on Mondays. If visiting the Academy Museum falls on a Monday on your itinerary, reservations will be made to visit the museum on Sunday upon arrival to Florence. Air passengers will depart from Milan airport. All return transfers will depart from Stresa for Milan airport. *Your boat trip to Capri may not be available due to inclement weather. **Your visit to Murano Island may be substituted with a visit to a local glass factory in Venice in the event of inclement weather. ***Due to inclement weather in the winter months, your farewell dinner at Isola dei Pescatori may not be possible. In such an event, your farewell dinner will take place in the town of Stresa.